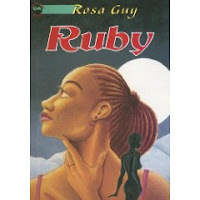 After Ruby's Mom dies, she's torn from the life she knew in the West Indies to live with her Dad in Harlem. Add your review of "Ruby" in comments! As far as I know, this is THE first lesbian YA novel, published two years before the classic "Happy Endings Are All Alike" and "Hey Dollface!" It's about a lonely African-American girl from the Caribbean who starts a romance with a more sophisticated girl. It's also sort of a sequel to "The Friends," which is about Ruby's sister. I think both books are definitely worth a read.